Are your donors having trouble deciding how much to donate? 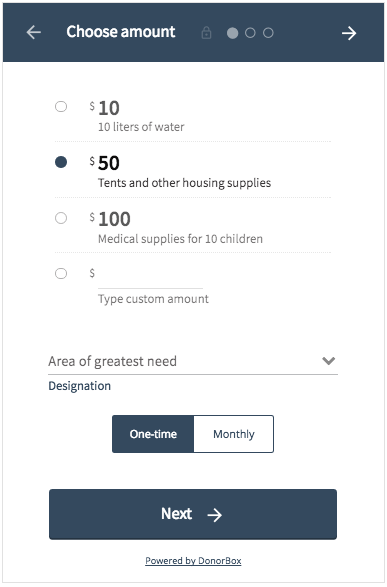 We recently added a new feature that allows you to pre-fill your donation forms with the default amount of your choice. This will further expedite the checkout process and encourage your donors to donate more than the minimum. To find out how it works, begin by clicking on the “Embed Form” button to the right of your campaign name. Check the box next to “Pre-fill default donation amount” and type in your desired default donation amount. Your embed code and preview will then update. If you typed in an amount that matches one of your form’s suggested amounts, that radio option will automatically be selected as contributors go to donate on your form. However, if you type in a default amount that does not match any of the suggested amounts on your form, the “custom amount” option will be selected with your default amount typed in. This option is available for your donation form embed code as well as for modal popup forms and donate buttons. For those of you who link to your secure donation page, this feature works for you as well. We added a link builder that allows you to customize your secured donation page. Click on the “Link to Donation Page” option in your dashboard and a configuration modal will pop up. This will show you how to pre-fill your default donation amount as well as set recurring donations on by default. Hello – What is the maximum dollar amount that can be donated via Donorbox in the custom field?